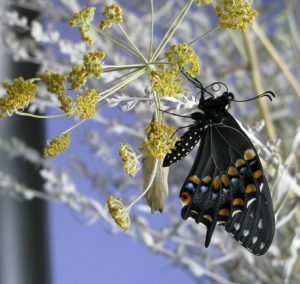 Eastern black swallowtail emerges from its chrysalis on a fennel plant. 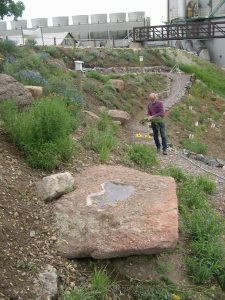 Last week, I headed to Denver to speak at Plant Select Day at Denver Botanic Gardens. My talk, "Design By Nature," explored gardens as natural communities that can provide crucial habitat for beleaguered species of pollinators--birds, butterflies, native bees and others--and in the doing, bring us the joy of experiencing nature in our daily lives. Biologists say that pollinators' partnerships with plants play a part in providing one in three mouthfuls that we eat and drink. Yet many pollinators are in trouble: Colony Collapse Disorder is decimating European honeybee colonies, whole species of native bees like bumblebees are vanishing, monarch butterfly populations are in peril, hummingbird populations are experiencing drastic fluctuations. What can we do to ensure a healthy food supply and the future of the birds, butterflies, and other species that brighten our lives and weave the global community that sustains this planet? Two of the biggest factors affecting pollinator populations are habitat loss and pesticide use. Who needs a lawn when you can have a wildflower-studded prairie? We have the habitat--right at home in our yards, pubic parks and golf courses, farms, orchards and other managed landscapes. Lawns occupy some 40 million acres of the United States and are some of the unhealthiest habitat around. Biologists who study native bee populations say that an 8-foot- by 10-foot patch planted with bee-friendly plants without pesticides is enough to make a significant difference for these inoffensive and hard-working pollinators. 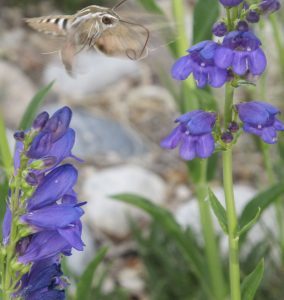 White-lined sphinx moth nectaring at Rocky Mountain penstemon in a local park. The two keys to providing effective habitat are design and health. Habitat design involves using plants pollinators will recognize and be able to use, and mimicking the "architecture"--the structure and scale of natural habitat. If the natural habitat is woodland, design a woodland garden, using shade and layers of plants similar to a natural woodland. 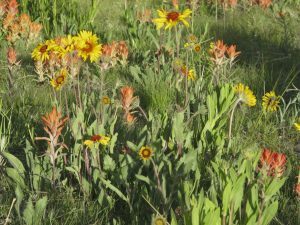 If it's prairie, design a prairie garden; if it's desert, a desert garden and so on. A healthy garden relies on the relationships between plants and their various partners to control "pest" populations, not on harmful synthetic chemicals. The wildscape at Cherokee Generating Station, a coal-fired power plant in industrial northwest Denver. Habitat Heroes are, in the words of the project's founder, Terra Board Member and passionate gardener Connie Holsinger, "Optimists–people who believe that the things they do can have positive impacts on the world around them." Habitat Heroes garden in a way that nurtures pollinators and other wildlife and restores healthy garden communities--along with our connection with nature right at home. The project sprouted late last winter and taking off much more quickly than we imagined. We all want to leave our patch of ground in better shape than we found it. We can do that, garden by garden. All it takes is soil, plants, and a willingness to learn from nature as we go. That's what the Habitat Hero project is about. Join us to make a positive change in the garden--and the world.